Would you rather cheer for a team that plays in a warm or cold climate? Or a team that plays in a dome? Is it important to you that the team you cheer for has been successful in the league recently? Is it important to you that the team you cheer for has been successful in the league historically throughout their existence? Is it important to you that the franchise you cheer for have a reputation as an honest organization? Select your favorite color from the list below. Would you prefer the team you cheer for to have a star Quarterback? What type of ownership group would you prefer the team you cheer for have? Do you prefer to cheer for an organization that has changed cities multiple times? Or one that has stayed in the same location their whole existence? It's football season but perhaps you don't have a team to cheer for. 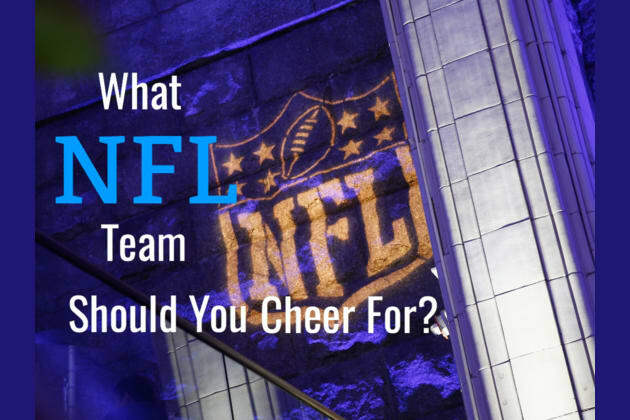 It's hard to be an NFL fan without a team allegiance so it's time for you to pick a side and join the fun. Answer these questions before you tailgate and we'll let you know which team you should be cheering for.